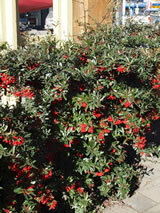 Extremely hardy shrub with attractive glossy green foliage. 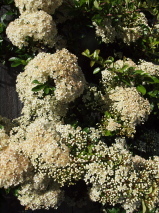 Masses of white flowers in spring, loved by bees. 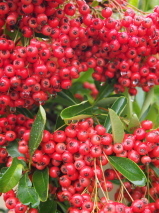 Through the Autumn into winter the plant is a mass of bright red berries. Wonderful to espalier against a wall or fence, so beautiful when in berry. Trim extra vegetative growth off after flowering leaving berries to show. Avoid planting in very hot dry sites. Very hardy to cold.